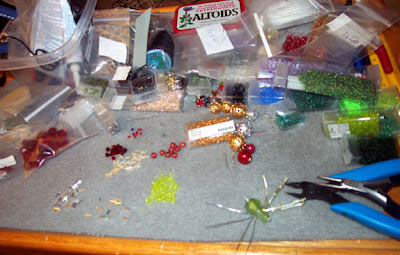 "I'm currently working on Christmas spiders to sell at my next holiday show. As you can see, my workspace gets cluttered quickly! I always have several projects going at once. I have several "workspaces"...some at home on TV trays, and some at the shop, taking over my class table. Eventually I get annoyed with the mess and clean everything up, only for it to get messy again!"